A balanced program is planned to promote the child’s cognitive, social, emotional, and physical growth. The curriculum emphasizes: large and fine motor development, independent activity periods which stimulate social interaction, imaginative growth, and dramatic expression; music and music appreciation; art, using a wide variety of mediums, puppetry; and finger-play and story periods. Because the preschooler is at an optimum age for learning, spatial relationships, mathematical concepts, and language development are presented on a stimulating level. The very spacious classrooms are equipped with developmentally appropriate materials to stimulate the child’s interest and invite exploration and experimentation through “hands on” activities. Block Area for creative block play; Houskeeping Area for dramatic and role play; Science Area – use of magnets, magnifying glasses, scales, varying seasonal science activities and experiments; Manipulative Area – objects and games aimed at the development of fine motor skills: lacing, stringing beads, Lego blocks, etc. 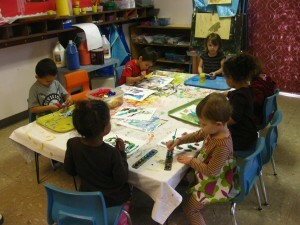 ); Art Area – free access to art materials and special art projects using a variety of mediums. Emphasis is on process-oriented art activities with the goal of developing the child’s creative expression. Children have access to many types of art mediums. They have the opportunity to finger paint, paint at easels, draw with markers and crayons, use scissors, glue and paste, and play with clay and playdough. These activities teach creativity, which assists a child in all aspects of his/her life. Our Music Teacher holds a Bachelor’s Degree in Music Education. View the entry about our Music Teacher and our goals for music for the children’s lives. Creative Movement is taught by all teachers utilizing balls, parachutes, obstacle courses, bean bags, scarves, and more to promote active fun and exercise. Our goal is promote an active, healthy lifestyle.